The Council Of Citizens is a call for a broad humanitarian coalition to apply justice and enforce Human Rights based on studies and researches undertaken by Human Rights’ activists, victims, academics and social researchers who found the reasons behind the thriving of injustice everywhere. The Council also studied the reasons of why revolutionary movements, humanitarian associations and political regimes have failed to eradicate injustice and empower the weak. And thus the Council Of Citizens created a practical solution for many problems related to misuse and abuse of power. The Council Of Citizens is a new theory which asserts that the principle of separation of powers has failed (in a nutshell) because Elites have united and agreed on protecting their misuse (abuse) of power (so the three political powers – executive, judicial, legislative – became one power again). Therefore, there is a need to establish a fourth political power constituted of four institutions designed to eliminate (or reduce) misuse (abuse) of power thus eradicating injustice that occurs for one or more of the following three reasons: Either the aggrieved person does not know his/her rights, or s/he does not know how to defend his/her rights, or s/he does not find anyone to stand besides him/her to defend his/her rights. The members of the Council Of Citizens refuse to run for elections or accept any position in the government or any affiliate body, and they do not support any party aiming to do so, either directly or indirectly. 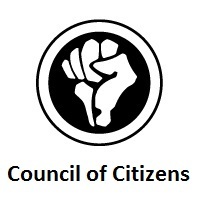 The Council Of Citizens proposes to change the methodology of thinking and working adopted in the last century in approaching the core and fundamental issues and instead to create a belonging and bonding between individuals on the basis of the Social Contract and Universal Humanitarian values far from national or religious partisanship or other views. The Council of Citizens does not seek to create a central command but shares the power (strength and influence), authority and resources through an innovative system which has been created to prevent any group or party from misusing or abusing its powers.